Bob was born in St. Paul, Minnesota and his wife Esther was born in Minong, Wisconsin. They met at North Central University in Minneapolis and have been married for 51 years. Bob has been ordained with the Assemblies of God for 55 years and they have pastored three churches and traveled as youth evangelists for several years. 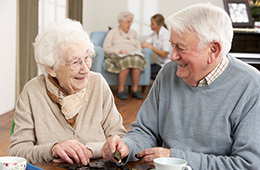 Bob and Esther have been residents of Monona Meadows since 1990. Manager, Julie Lemke, writes, “For a few extraordinary people, volunteerism isn’t just something they do in their spare time, it’s who they are. No one exemplifies this better than Bob and Esther Olson. It can be seen in the leadership roles they take on, the volunteer opportunities they commit to, and the spirit of service with which they meet each day. For almost 20 years, Bob and Esther have enhanced the lives of their fellow residents at Monona Meadows. It’s easy to attend parties and never think about who picked up the cake or made the coffee, or smile when your door magically gets decorated each year on your birthday and never wonder how time-consuming it must be to keep track of all those dates. They have donated their time to run the monthly birthday bash. They’ve arranged for children from their church to sing for residents for the holidays. As a seasoned performer, Bob has delighted residents with his ventriloquist act, magic shows, and guitar performances for years. Esther shares home-cooked meals and treats for those in need and residents who are ill. She is a member of Monona Meadows’ very active Project HA.N.D.S. group, and she has knitted countless items to be donated to local children in need. 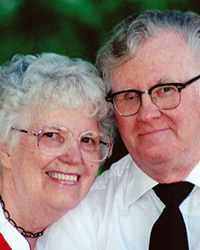 RHF is pleased to recognize Bob and Esther Olson as our 2010 Residents of the Year.